honestbee is now in Malaysia! Have you ever had those days where you're lacking of ingredients to cook your dinner at home, and youre just too tired to go out to the grocery store just to get your missing butter and eggs? 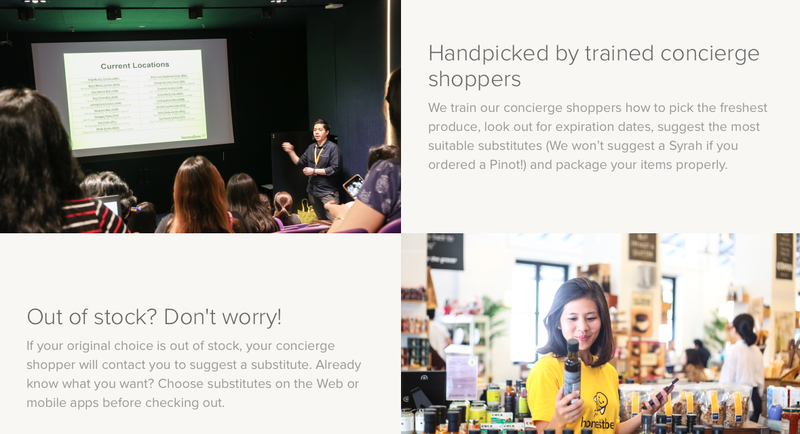 Well, looks like you wont have to worry anymore as there is now a great new way to shop for groceries and household necessities online, thanks to honestbee, Asia’s fastest-growing and leading online grocery concierge and delivery service. honestbee sets itself apart by establishing partnerships with leading supermarkets, specialty stores and farm to table grocers. And with that, customers (generally people like you and me) can enjoy the convenience of shopping from specialty curated stores with a click of a button on your phone. All you need to do is order products from your favourite store via honestbee’s app or website, and a concierge shopper will personally handpick the best products for your. Being a person who likes to pick fruits, i admit that im usually extra picky and picking does consume a lot of time. But now with honestbee, i wont need to worry as i'll have someone to pickout my groceries for me! Once the groceries are picked, they are then delivered right to the your doorstep on the very same day, within the hour selected by the customer. Sweet! Living in a fast-paced world, i think we are all trying to look for alternatives to constantly try to save time. And with honestbee, i would say that it makes our daily lifes easier as we can use our valueable time on whats more important while honestbee give us less hassle. Psst, i was also told that honestbee concierge shoppers are well-trained to ensure that the items in our shopping cart, including meat and products, are carefully handpicked with freshness guaranteed. One of their partenrs, Southern Rock Seafood. Also not to forget the fresh fruits available too! The honestbee platform currently partners with more than 10 well-renowned outlets – a list which is set to grow through the year. These include: anchor partner Ben’s Independent Grocer (B.I.G. ); as well as specialty stores such as Shojikiya, Fareastflora.com, Cat & The Fiddle, Southern Rock Seafood, Castania Nut Boutique Vom Fass, The Blue Cow Butcher, La Juiceria, Wondermilk, Wine Connection, Cookie Box, GNC, Real Food and Chai Huat Hin and farm to table grocer Jezripe. And yknow what? Im a fan of at least half of the stores listed here! SO YAY! honestbee is already popular in Singapore since its launch in 2015, and can you believe that honestbee has expanded so quickly in the past 19 months across major cities across Asia, including Kuala Lumpur, Malaysia. honestbee is targeting to expand their service to other cities by the end of 2017 which i find really exciting! With technological expertise and efficient network, honestbee now brings convenience and ease to shopping, delivering groceries within the next hour time slot. Who knew that could be possible? In conjunction with the official launch, honestbee will be providing RM 1 delivery with no minimum spend for all stores from now until 14th March 2017. So you better take this once in a life time opportunity as RM1 is cheaper than your parking when youre out doing grocery shopping. The honestbee platform in Malaysia can be accessed by logging on to https://honestbee.my or downloading the honestbee app via the Apple App Store or Google Play Store. What are you waiting for? Its time to welcome the future of grocery shopping. Always heard about Honestbee but haven't try before. Will give it a try someday. Honestly, I have never heard of Honestbee before this. Great initiative in starting a delivery service for groceries as well! It's incredibly useful on days you're a bit lazy to go for grocery shopping or if you don't have transport. I have seen others using it recently. I will give it a try soon too. Looks really convenient for me. Will try it out. Although this is the first time I have heard of HonestBee, this is not a new concept. However, I just hope they expand to Ipoh!! I was shop online in HonestBee b4. But the delivery places are available in Mont Kiara, Sri Hartamas, KL only, not Klang Valley. This looks really good Aliza dear and seems to be quite convenient too :) All up for this so will certainly try the service out. too bad i stayed outside of those area :(. if not would have tried their services. Wow, very first time I heard about Honestbee. Seriously I will give a try on it! Such a nice post, I like your Post.This is too much informational. The online grocery and medicine supermarket day2day store are providing goods with the chance to earn money online also. [BEAUTY] Watsons WATER360's new look! What to do during Earth Hour 2017 in Malaysia?